I figured I might as well use the title since I hinted this was coming yesterday. I have hinted, I have posted, I have mentioned recently that I am going to be moving to a new place. Which is VERY EXCITING. Yet at the same time very terrifying. I am not going to go into the reasons why here. Sometimes people I know actually read this. Strange, but true. So with that being said, I am preparing myself for all of the new challenges my new parish, my new job, and everything else I may run into throws at me. The one thing that means is that I need to pack. I have been packing and moving stuff since late May/early June. I did not want to be running around this last week, packing stuff, but getting hit with funerals and stuff like that, that would take up my free time. I still have a job to do where I am and there were no plans on my part to slack off in the least. While my process has been sporadic and erratic as things stand, 95% of the packing is done and most of that stuff is moved to my parents house, which is close by to where I will be living. Yet at the same time when it comes to packing and moving some of the extras or things I won’t need onward. I can’t do it. This box here has my extra cgm’s and the latest batch of supplies that I ordered from Animas and didn’t need yet. I could easily have taken this huge box and brought it home. Heck, I could have had my dad take it home with him this weekend, when he took my bike, my tv, my hassock and other big things. It would make sense, seeing as how big the box is. However, I couldn’t do it. Why? I don’t know. I still have 5/6 infusion sets in my closet, plus my emergency one in my travel bag. Nope. I kept the box. 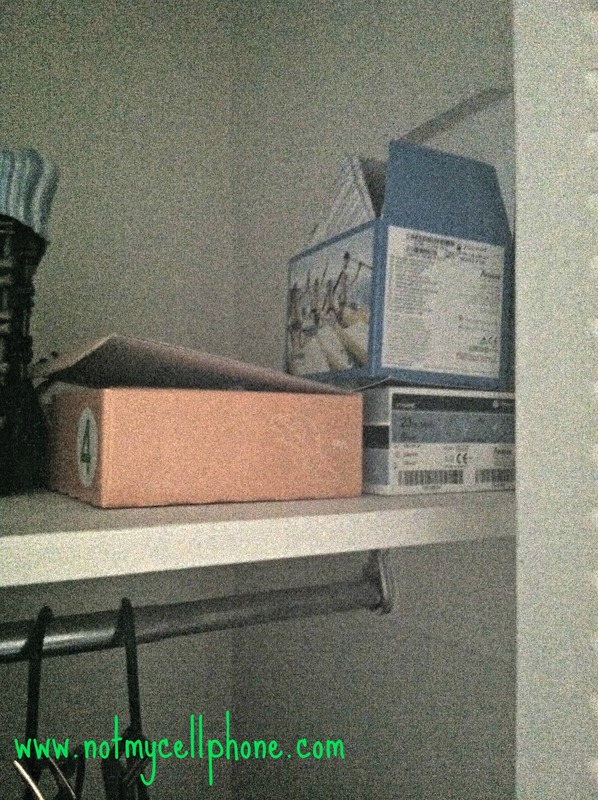 While yes my closet looks empty, I can survive without my diabetes supplies right now. This could get me by. Not to mention I have my Nike sport bag filled with insulin, syringes, test strips, lancets, and well no batteries, since I just used the last one up. But that bag alone, let alone the bag filled with my diabetes travel supplies could get me through the week. Oh and I have Humulin NPH as well, just in case. However, there is a small part of me that cannot let this box out of my sight and I do not know why. I know where it will be, it will be safe. Heaven forbid I need it, it’s a forty five … fifty five minute drive to the supplies. Not the end of the world. Hell my dad could drop something off on his way to work if necessary. Yet, I am unable to say goodbye to this box. It’s messed up. I have never been in a supply crunch. I have never panicked about it, yet this box and all of its goodness is something I can’t live without. TV fine, Xbox/PS3 gone for weeks, books… BOOOOOKS okay fine. Yet ask me to send this box northward. I just cannot do it. How about you? Could you do it? Moving is very stressful and from all Ive seen you are handling it with a great amount of Grace. As far as the box, I get it. Just before we moved from tX to CA I had ordered 3 months supplies for both kids. Thats a total of 10 boxes of site changes, 10 boxes of reservoirs, 20 boxes of test strips, 6 vials of insulin. In addition to that I still had at least a months worth of supplies left for each child. I kept it all with me. Everything. I didn’t let the movers pack it. Granted my move was over 2000 miles and there was a two week storage period involved. At minimum anyone would have kept the test strips and insulin with them because they are temperature sensitive. Still I kept it all. It took up an entire suitcase. I had to keep it. There was always a what if… I couldn’t think of what the what if… would be but it was there. We drove to CA in my van. I had 3 kids, 2 dogs, 2 cats and my dad – and my huge suitcase of diabetes supplies. We stopped at 2 hotels between Austin TX and Phoenix AZ. The suitcase came inside each time. We stayed at my folks house in Phoenix for a week – the suitcase came inside. We stopped at 2 hotels between Phoenix and San Fran – the suitcase came inside – the suitcase was never opened all that time. It wasn’t opened and unpacked until we were moved into our new home. I needed to know it was safe and with me always -despite having everything I needed for the two week journey in my smaller backpack. I get that you kept the box close to you. When the things we need to stay alive or keep loved ones alive fit in a box – the box stays with us. I am so excited for you to start your new adventure and I can’t wait to hear about your first week when we meet up in just 12 days. i guess sometimes it is our quirks that also define us. It’s funny the box is safely in my new place, even though I am not there and now I don’t pay it any heed, even though I am spending the night at my parents house. Nuts. My box of diabetes supplies was the last thing that went into the truck when I moved. And then I think I asked my dad where it was 3 or 4 more times after that. I knew I was going to be without insurance for a little while so I could let anything happen to that stuff!